Welcome to this weeks Kids in the Kitchen, This week the Little Man helped me make Soda Bread, which is really easy and quick to make, and it involves kneading, and kids love kneading. It was such a lovely loaf that I’ve decided to enter it into the Bakespiration competition. Last week, Little Miss T showed us how she makes Naan Bread over on the Beesley Buzz. Thank you for joining in and I hope that there will be others joining us this week as I’d love to see what everyone is up to in the kitchen with their kids. 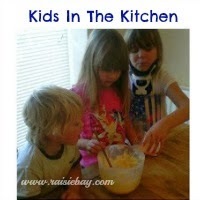 If you would like to know more about Kids in the Kitchen and why I started the linky you can read all about it here. Sometimes it feels like a task to get the kids in the kitchen, and it can be very very messy. It’s all worth it though because they have so much fun and are learning all the time. My mum never cooked with me (although I did do a little baking with my nan) and when I left home to get married at 19 (I know, I was a bit young!) I did not have a clue. My husband had to teach me everything, even how to boil an egg. It’s funny, he was watching me decorate a wedding cake a couple of weeks ago and commented on this! I guess I’ve learnt a lot in the thirty years since. (eeek!) I digress a little…what I’m trying to say is, I want my kids to be able to cook, it is, after all, a very useful skill to have. So do come and join us, find some inspiration and encourage your kids to cook with you, you won’t regret it. I remember watching Masterchef not so long ago, that part where they are shown some food and have to write down the ingredients and then go and replicate the food. Well, in this particular episode there was Soda Bread and I was amazed at how many of the contestants had no idea and where trying to make bread in various ways such as proving it in a warm oven. You see, that’s the beauty of Soda Bread, you mix it up, knead it and then pop it in the oven. No need to leave it under a tea cloth for a couple of hours to rise! It’s so quick and easy to make. If you don’t have buttermilk you can make it by leaving the milk at room temperature for about an hour after adding 1 tsp of lemon juice. Or another alternative is to use half milk and half natural yoghurt. shape into a dome and then cut a cross in the top. If you would like to join then please link up your posts old or new below.